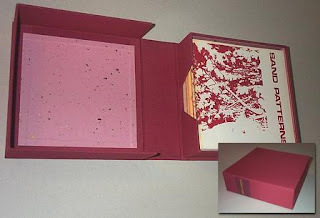 One of the courses I took at the Dawson Print Shop was a full term of boxes and portfolios and I did many boxes in many forms... a lot of small decorative boxes that were never photographed. But when I was sorting my digital photos, I found some that actually were photographed and decided to share them here as well. And a couple of Japanese boxes. 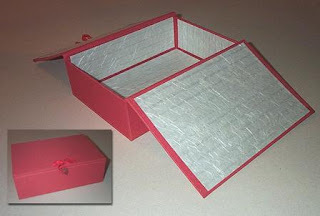 I skipped a step when I was making this red box, and had to fashion an inferior closure as a result. But it works for storing my thread. 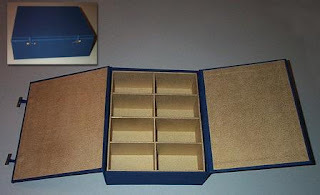 The blue and gold box is one that I made by request for someone who wanted it for a collection of wrist watches. I've been uploading some of these older photos to Flickr as well. You can see these and a few other boxes in the "box making" set. I've also added several photos of leather journals and other early work like the things from my last blog post here. And by "early work" I mean, well, anywhere from 2 to 6 years ago. I took a lot of photos but I rarely dated the photos or the books so often I'm unsure exactly when something was done... I am trying to be better about that now... Trying to get better photos now too, some of these older photos are terrible! The magic boxes remind me of the Jacob's Ladder, which is so playful and mysterious and magical as well. 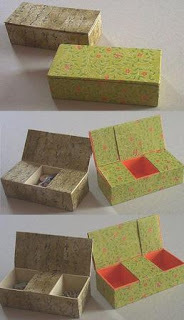 I love the idea of the surprise in the box. you're right, the magic box lid is attached using the same structure as Jacob's Ladder - so it's quite fun! Rhonda, I just wanted to let you know I've tagged you for the same thing Barbara did 'cause I wanted to see your answers! Greetings from a fellow Dal Library School (or whatever they're calling it now) graduate! I also took a course in the basement print shop on typesetting. Wish they had had the things you've taken, though. Your boxes and books look fabulous!